Pike and Shot To Impact and Salvo – Warfare 1550-1815: BARREN HILL, PENNSYLVANIA. For a foreign volunteer, Marie-Joseph-Paul-Yves-Roch Gilbert du Motier, the Marquis de Lafayette, enjoyed extraordinarily rapid advancement in the American military establishment after arriving in America in June 1777. In mid-August the commander in chief, George Washington, could neither spell nor correctly pronounce his aristocratic name. Barely more than a month later, after Lafayette had performed bravely and resourcefully at Brandywine, an admiring Washington began drawing him into his inner circle of aides. The wounded Lafayette rehabilitated his leg in a hospital at Bethlehem and rejoined the Continental army in December. During the early part of the winter at Valley Forge in 1777–1778, Lafayette remained staunchly loyal to Washington through the weeks of institutional intrigue and personal recrimination within the Continental establishment that some historians have mislabeled the Conway Cabal. What Lafayette did not receive from his commander and now his mentor—and which he wanted very badly both for reasons of personal honor and to gratify the yearnings of youth—was a field command leading troops in circumstances of combat or at least the potential for combat. The limited types of operational assignments available in the late fall and early winter, after Lafayette returned to camp and later at Valley Forge, involved small unit patrolling and skirmishing of a nature poorly suited to whatever military skills the marquis may have possessed. Washington preferred Lafayette’s presence at headquarters, and for the sake of his diplomatic value, he could not have afforded to have him killed or captured performing minor patrol duties. In January 1778 the new Board of War, an administrative agency headed by Washington’s rival, General Horatio Gates, pushed through the Congress a plan for a Continental invasion of Canada. Perhaps seeking to buffer the plan politically with a nomination from Washington’s own suite, it recommended Lafayette to lead the expedition. Despite Lafayette’s hearty distrust of Washington’s adversaries, he could not resist this opportunity for action and glory, nor could Washington refuse his prote´ge´ the opportunity. To Lafayette’s great credit, when he reached Albany—the expedition’s departure point—in mid- February, he recognized the folly of the very idea of a midwinter invasion, and he was gratified when the project was abandoned. Then he returned to Valley Forge, where he continued to champion Washington’s interests and agenda. Washington, meanwhile, found his tactical and strategic intentions for the winter increasingly pressured by events. Despite a preference of his generals to place the army in inland urban quarters for the winter, he had personally brokered the compromise decision for the army to remain in the field, in deference to the political sensibilities of the Revolutionary political bodies, especially the beleaguered state government of Pennsylvania. He arranged a division of responsibility for securing the Philadelphia countryside by which the Continental army assumed control of the territory west of the Schuylkill River to the Delaware River near Wilmington. The state government, meanwhile, promised to keep enough militia in the field to patrol the area east of the Schuylkill to the Delaware at Trenton, New Jersey. Even when the state’s ability to meet this manpower commitment faltered, Washington resisted pressures to fill the territorial gap by expanding the sphere of army responsibility. Only when bold British and partisan guerilla raiding east of the Schuylkill in February threatened the army’s supply line to the northern states during a severe provisions crisis did Washington reluctantly agree to make even modest increases in the small Continental security patrols already working east of the Schuylkill. By the late spring, the complete collapse of American militia resistance and modest improvements in Continental strength and proficiency levels caused Washington to rethink this approach and to gradually increase the army’s involvement in Philadelphia and Bucks Counties. General Howe, meanwhile, took advantage of American tactical disabilities in the field to send increasingly aggressive patrols of British and partisan raiders into the area to attack both military and civilian targets. In mid-May 1778, after the announcement and celebration of the new American alliance with France and during the transition in command in Philadelphia from the retiring William Howe to his successor, Henry Clinton, the British sent a party up the Delaware to attack rebel nautical facilities at Bordentown, New Jersey, and Bristol, Pennsylvania. Extensive damage was done to civilian property and morale in that area, and predictable demands emerged from the Pennsylvania government for the army to respond to the crisis. Washington ordered Continental troops patrolling near the Schuylkill under the command of Brigadier General William Maxwell to move north toward Trenton to respond to the incursion. This mission expansion tore the Continental grip loose from the Schuylkill River, leaving a gap in the army’s immediate security system near Valley Forge that could not be tolerated. 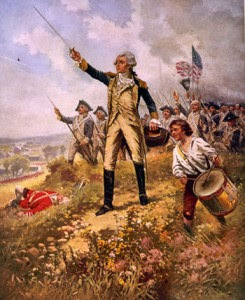 On 18 May, Washington was finally able to gratify the thirst of the loyal and generally uncomplaining Lafayette for a field command. He ordered his protégé to lead an expedition of about twenty-two hundred troops across the Schuylkill to cover Maxwell’s previous positions. 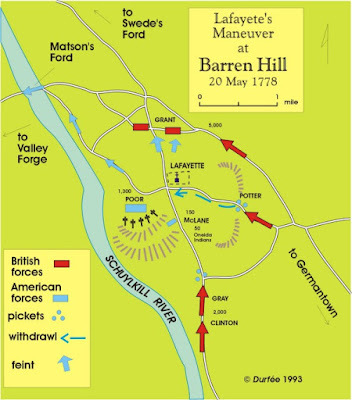 He reminded Lafayette of the large size and importance of his detachment and warned him to move warily and to avoid being engaged by a major enemy force or being cut off from a retreat to the west side of the river. The British quickly discovered the inexperienced Lafayette’s presence in the area. They increased their routine patrols and intelligence activity to protect the meschianza, an elaborate festival that the officers planned to bid farewell to their departing commander, Howe. 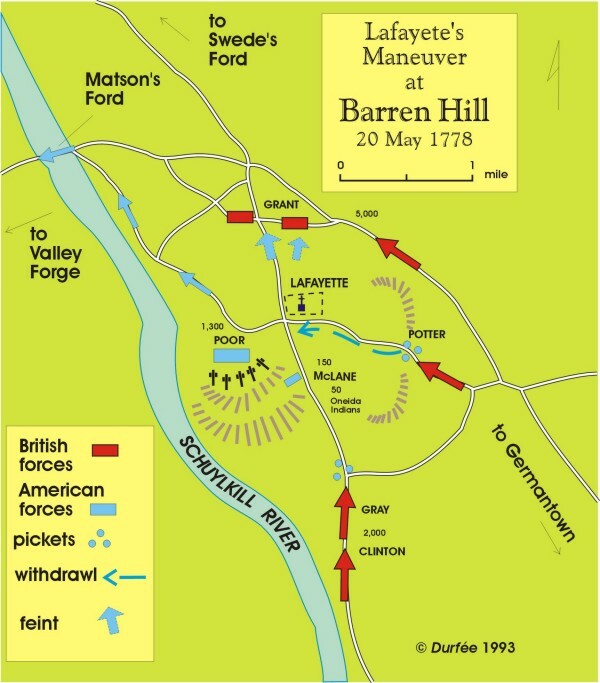 Late on the evening of 19 May, Clinton learned that Lafayette had taken a stationary post at Barren Hill, an elevated plateau just beyond Chestnut Hill, northwest of Germantown. Clinton sent a party of between five thousand and six thousand British regulars and Hessians under General James Grant to try to get beyond Lafayette’s position and between it and Valley Forge. Early the next morning, the superseded Howe was given the honor of leading the main body of the army up the Germantown Road with the intention of trapping Lafayette between Howe’s and Grant’s forces. General Charles Gray was sent with a party of troops to intercept any retreat to alternate Schuylkill fords. Lafayette, who had with him a group of Indian scouts, was alerted to the maneuver. He notified Washington and quickly made arrangements to withdraw across the Schuylkill by the one still-unobstructed road to Matson’s Ford. Washington, mortified that his young aide had put him into this compromised position, prepared to lead most of the army to his rescue, risking the general action that he had carefully avoided for most of the previous year. Lafayette was accused by British sources of having ‘‘sacrific[ ed] his rear guard’’ in his haste to retreat, and several soldiers were indeed drowned, otherwise killed, or captured in or near the river. Most British and Hessian memoirists blamed Grant for moving too slowly and for hesitating to spring the trap that they believed he had it in his hands to close. For Howe, the event—supplemented with whispered criticisms for the excesses of the meschianza—punctuated the overall failure of his strategy to that point. From a strictly military point of view, Barren Hill was not an important or even a very memorable event. One would not be able to say that, however, if Lafayette, with nearly one-fifth of the Continental army, had been cut off and captured or if Washington had fought and lost an inadvisable general battle that day to rescue his spirited but headstrong aide. Official American casualties were six men killed and about twelve captured. British losses in this action are not reliably known. BIBLIOGRAPHY Gottschalk, Louis. Lafayette Joins the American Army. Chicago: University of Chicago Press, 1937. Lengel, Edward G. General George Washington, A Military Life. New York: Random House, 2005. Taafe, Stephen. The Philadelphia Campaign, 1777–1778. Lawrence, Kans. : University Press of Kansas, 2003. When LaFayette visited the US in the 1820s he essentially visited and was feted by every Masonic lodge in the country... and gave pretty much the same speech, verbatim at each stop. The speeches are preserved in their minutes. (I've read the ones of the meeting of the Nashville lodge as well as those preserved by the Wilmington, DE, lodge, and they are identical). In this speech he says that Washington would not entrust him with a major command (he is talking about a division sized force) until he reaffirmed his Freemasonry. Further research revealed this ceremony took place in the King of Prussia tavern in very early May, and within a week Washington entrusted him with the force that went to Barren Hill.